I was raised in church and the Christian faith. I’ve spent most of my adult life and career in Christian ministry and service. Many times I’ve shared from the stage that I believe we complicate our faith when we debate and argue over minor points of doctrine. While theology and doctrine have their place, for me, it always comes back to this, “Jesus loves me. This I know!” Because of this, I was very intrigued by this book. 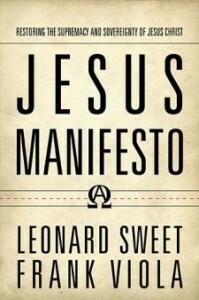 In Jesus Manifesto, the authors explore the possibility that the church today has lost sight of the fact that Jesus is the core of our beliefs and faith. There are many detracting elements that we (people in the church) have allowed to become our central focus and sometimes basis of belief, when it’s Jesus we need to put our hearts and minds and assurance on. While I was very interested in a lot of what the authors had to say, I was often lost a little in the lengthy attempts they went to in making their point. I also felt like some of the language tended to be somewhat ‘churchy’ and a bit ‘lofty’ as if written by theologians for theologians. I think the message of this book is solid enough to reach people outside of seminary theology departments and could have been written a bit more accessible for the masses. However, having read books by both of these authors in the past, it’s not out of character for them to write in this fashion. I really appreciated the heart of the message in this book. I agree that Jesus is absolutely at the center of our theology, our belief, our faith. I was challenged to continue looking to Jesus first and then figuring the other stuff out along the way. Although there are some dry patches in the journey of this read, I felt like it was a thought provoking book. If you’re looking at some of the ‘why’s’ in how we do things in churches or in our faith, this book could be a resource to help bring you back to center and help keep your heart and mind on what’s true and important…Jesus! Christians have made the gospel about so many things…things other than Christ. What is Christianity? It is Christ. Nothing more, nothing less. Christianity is not an ideology and not a philosophy. Christianity is the Good News that beauty, truth, and goodness are found in a Person. And conversion? It’s more than a change in direction; it’s a change in connection. Christians don’t follow Christianity; they follow Christ Christians don’t proclaim themselves; they proclaim Christ Christians don’t point people to core values; they point people to the Cross Christians don’t preach about Christ; they preach Christ What is presented is razor-sharp, cut-glass clarity of the Lord Jesus Christ. It has never been more valuable or more needed.